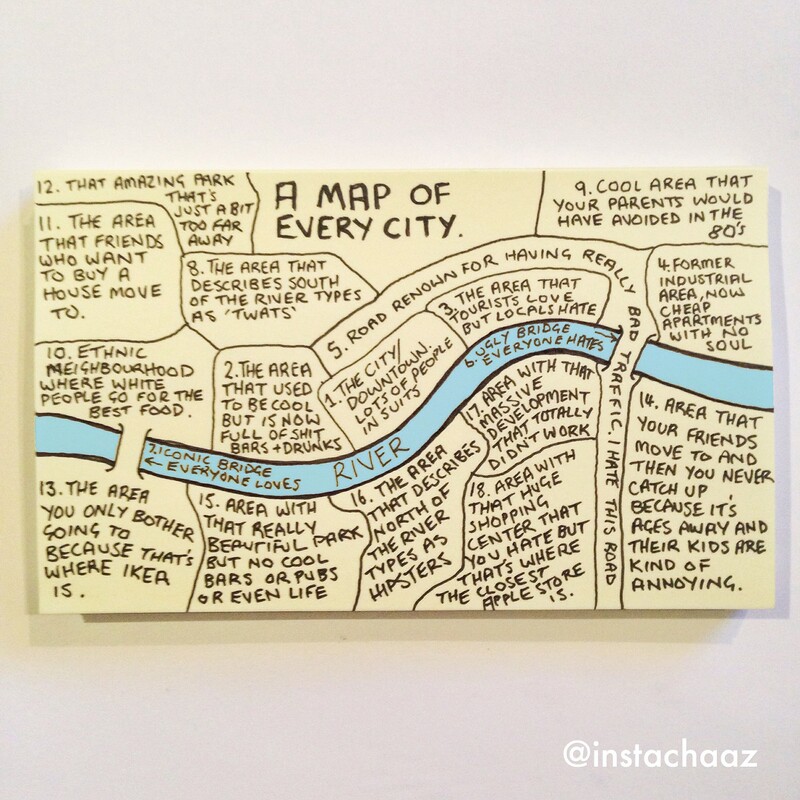 Sketched on a sticky note and posted to Twitter and Instagram, the “map of every city” quickly became a viral sensation as people read their own locations onto this wonderful work of subjective cartography. Designed by artist Chaz Hutton, the drawing is not really a map as such, but it does feature elements we recognize from maps. There is a winding river and set of bridges that cue us in about what we are seeing. Yet it is not a representation of any particular place. 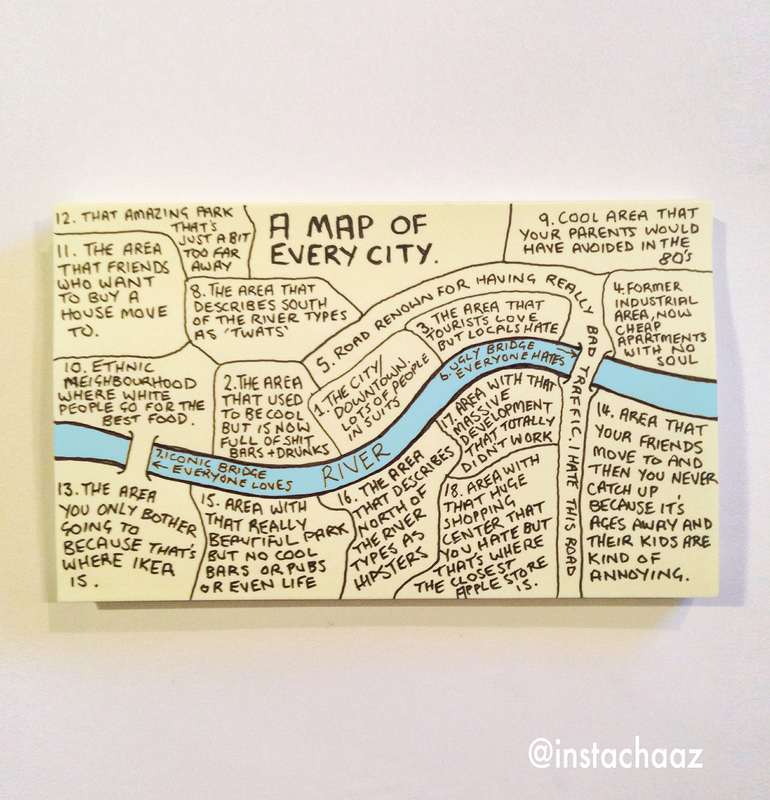 Once Hutton posted his sketch online, people immediately began “identifying” the fictional location as a city (Nashville, Paris, and Seoul among others). Some posters even started to overlay the image on actual maps to try and find the secret metropolis. 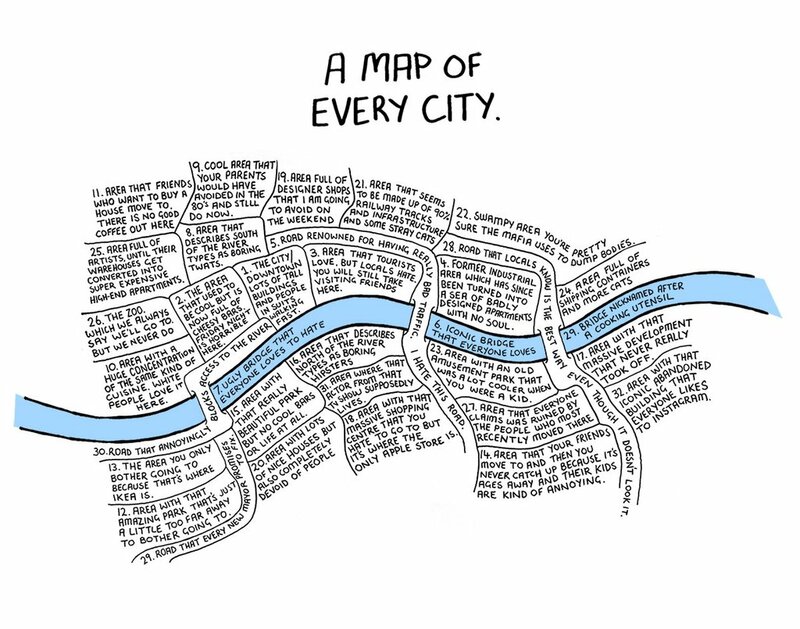 Despite its fictional nature, the “map of every city” does reflect certain realities of urban growth and development. Cities often get started on the banks of rivers, for instance. Central property values, in turn, tend to increase as a city expands outward from its starting point. At the same time, working-class neighborhoods tend to form to support riverside industry. These then gentrify over decades and centuries. Nor is the idea of sketching out general maps a novel one. 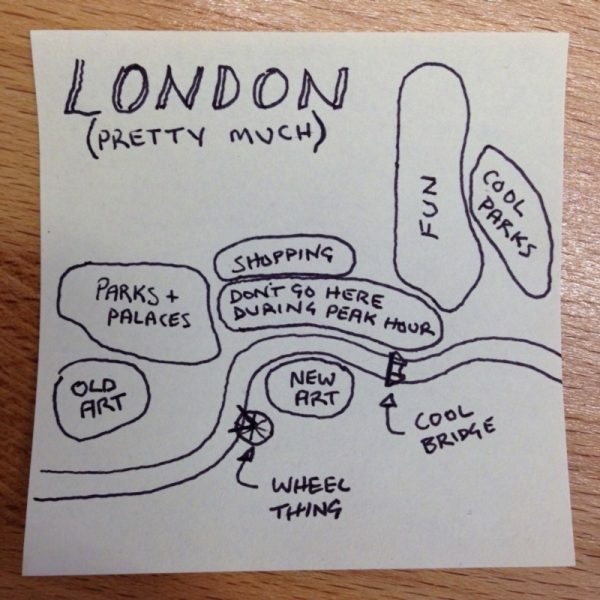 People have been creating subjective (or: judgmental) maps for years and posting them online. These inevitably contain bias, but in many cases add helpful layers that let visitors quickly parse unfamiliar places. 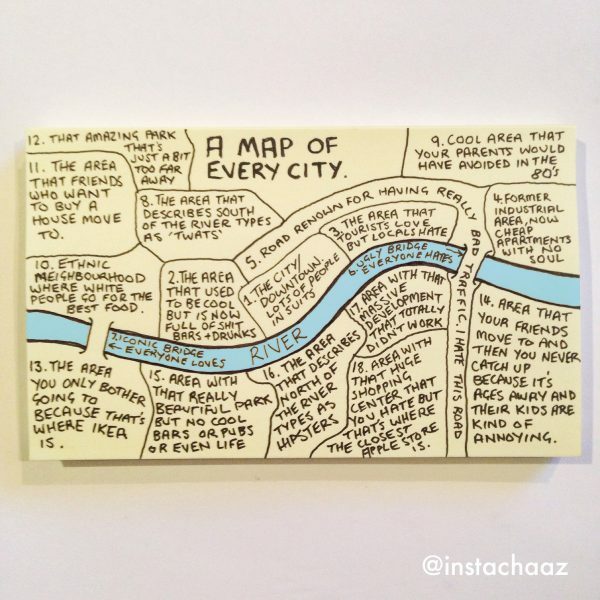 While subjectivity can work against a map trying to get people between places, it can also be informative for travelers unsure where to start. Even if the mapmaker’s interests are not aligned with yours, their work may still allow you to find that hipster hideaway you were looking for. 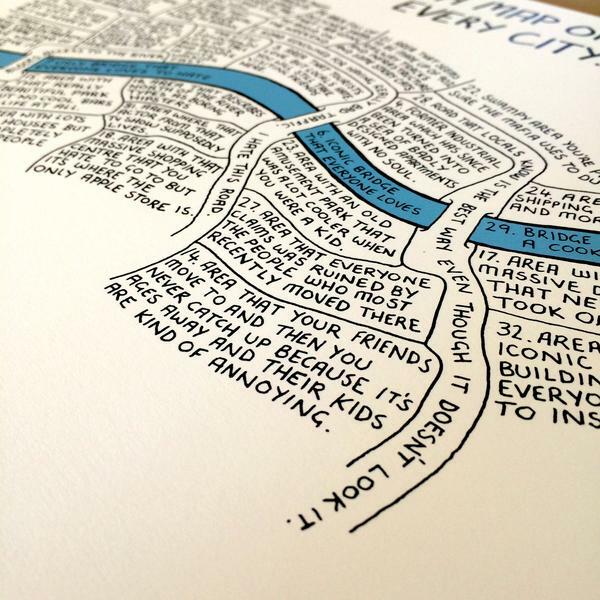 Hutton, meanwhile, has since expanded his map to create a print. Alas, it is currently sold out, but perhaps he will make another run down the line. Alternatively, now that you know how it works, you can create your own map of your (or: every) city. 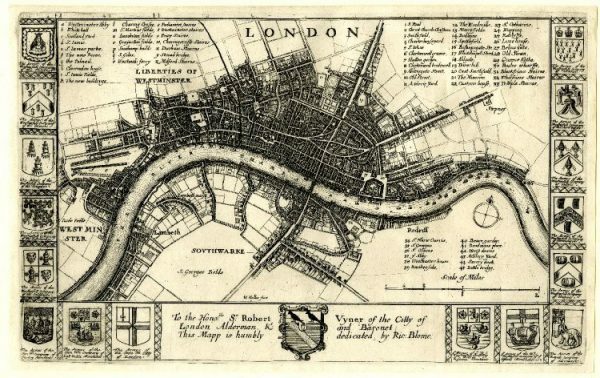 A good starting point: overlay some trace paper on a map (or add transparency to an underlying map layer in Photoshop). Then begin to draw out boundaries and describe areas based on experience (and opinion). If you are feeling creative, you can start to merge elements from maps of different cities, generating a fictional metropolis of your very own. Tweet us the results at @99piorg!